"I made this recipe after seeing a spicy mac and cheese on TV. There was no recipe, so I just made one up. While it didn't seem very spicy to me, it came out delightfully creamy and gooey with just a hint of a kick." Place Anaheim peppers in a blender and blend, adding olive oil as needed to create a smooth paste. Heat cream in a pot over medium heat; stir in butter. Add Anaheim pepper paste, pepper Jack cheese, Parmesan cheese, mozzarella cheese, Mexican cheese blend; cook, stirring constantly, until cheeses are melted and sauce is smooth, 5 to 10 minutes. Season with salt and white pepper. 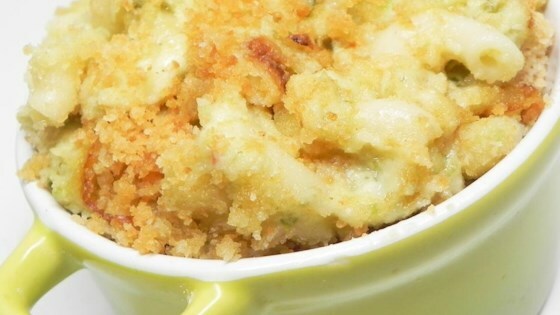 Stir cheese sauce into elbow macaroni; transfer to a casserole dish and top with crushed crackers. Bake in the preheated oven until topping is browned and cheese is bubbling, 20 to 25 minutes. Adjust for spice by using or removing the seeds and pulp from the Anaheim peppers. This was absolutely delicious!!! I made this for a party so I went little light on the pepper jack but it still had nice heat. Will definitely make again! yummy!! mac N Cheese.. lovi t! !